This all started with a can of pumpkin that I inherited when I cleaned out a friend’s pantry. In my search for an interesting twist on pumpkin muffins, I came across a dairy-free, egg-free pumpkin loaf recipe on Food52. Intrigued by the magic of how this could possibly work without some kind of binder, I gave it a go. What a wonderful discovery! This loaf is moist, airy, with a good a hint of spice, and it’s a great base for incorporating your favourite flavour additions – raisins, walnuts, pumpkin seeds, chocolate chunks. 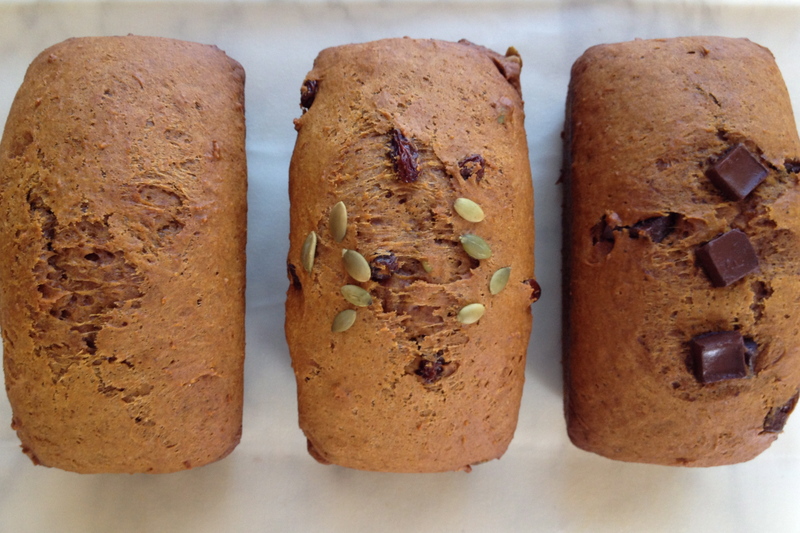 I have adjusted the original recipe to use a 15oz can of pumpkin puree, and to bake it as three mini loaves. Enjoy it for breakfast with some almond butter or whipped cream cheese, or as an afternoon snack. Wrap it well, and it will stay moist for a few days, so you can enjoy it alongside your Thanksgiving leftovers. Combine dry ingredients in a medium mixing bowl. In a separate bowl, combine oil and pumpkin puree. Add wet ingredients to dry and stir until well combined. This makes a fairly dry dough, so keep stirring until all the dry ingredients are incorporated. Add pumpkin seeds, walnuts, raisins, or chocolate chips, if using. To make three different mini loaves, divide the batter into three small bowls and then add your favourite flavour additions to each. Transfer to three lightly greased loaf pans. Smooth the top of each loaf with a spatula. Bake at 325F for approximately 50 minutes. Loaves should be springy and a toothpick should come out clean when inserted.